I was going for something plain on my nails, but ended up wearing the most special polish I own: OPI DS Glamour, on top of two coats of Orly Royal Navy. No need to say it's an absolute stunner, look at that! Though it looks even better in real life. I still can't believe how intense the (slightly scattered) holographic finish is, even in the shadow! Sadly this polish is discontinued too, as you might know. Never in my wildest dreams did I expect to own it someday. But I must've done something right, because last year I was very lucky to get my hands on one bottle through a swap. (Thank you so much, Viktorija!) It felt like winning the lottery... :3 What's the most special polish that you own? This is a wow polish, thank you for sharing its awesomeness! so jealous! this is super gorgeous! 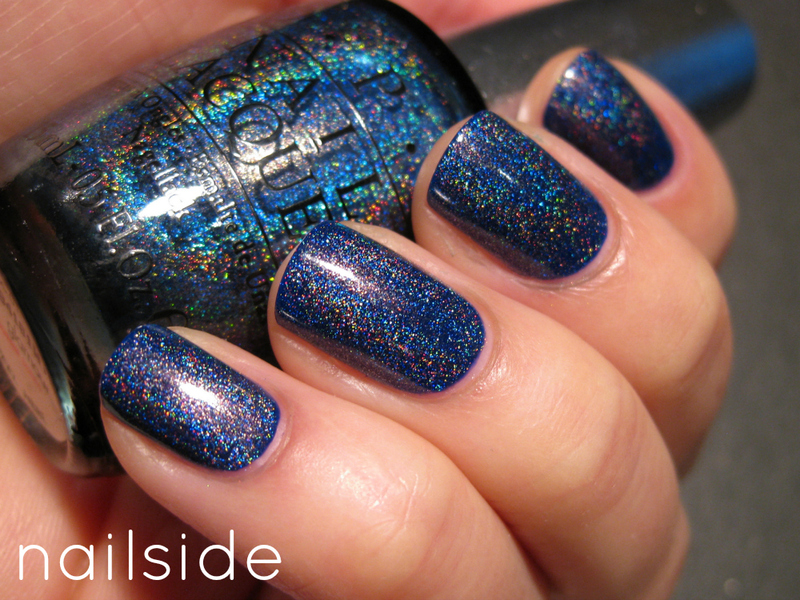 wow, such an intense holo! Probably Changing of the Garnet. I had a bottle that was old and gunky. My birthstone is Garnet. I ordered a bottle on Amazon (I think). It's one of my favorites. And I'd probably also say China Glaze's For Aubrey. Not b/c it doesn't exist any longer. But, b/c I love anything Tiffany & Co. And finally my discontinued OPI DS Passion. However with 300+ of polish it was hard to choose. Wow, that's so amazing. Such a shame it's discontinued, you are very lucky! I don't think I have anything as special as this. I want this one so freakin bad! Beautiful. Well, that was silly of them to discontinue this polish. Don Juan's One Coat OC 227, Flormar's U33 and a no name, as far as I can remember, fuchsia. Mine has to be Man with a Golden Gun that I got for Christmas from my lovely fiance. I love this polish though, so pretty! This is such a huge lemming of mine. I absolutely love this polish! What a lovely polish! I love that shine! Love! Favorite blue is China Glaze Shower Together and I love Out the Door Northern Lights. Ugh I'm so jealous. ;P I think my most prized polish is either OPI Absolutely Alice or GOSH Holographic...probably Absolutely Alice, because, GLITTER. wow this is amazingly gorgeous! I don't know why I don't own any colors from that line...I need some! This is one of my major lemmings - it is just so stunning! such a beautiful nail polish! Wow!! I want this polish!! Amazing! That's stinks you can't get that polish anymore.....gorg! I wish I could have seen it in real life.....live special polishes like that.....enjoy it.